Solid Chocolate Cake Mrs Waterburys 1 tablespoon shortening 1 cup sugar 1/2 " cocoa 1 1/2 " flour Salt 1 teaspoon soda in 1 cup sweet milk 1 teaspoon vinegar vanilla Add cocoa to flour & sift. Snowball Cake. 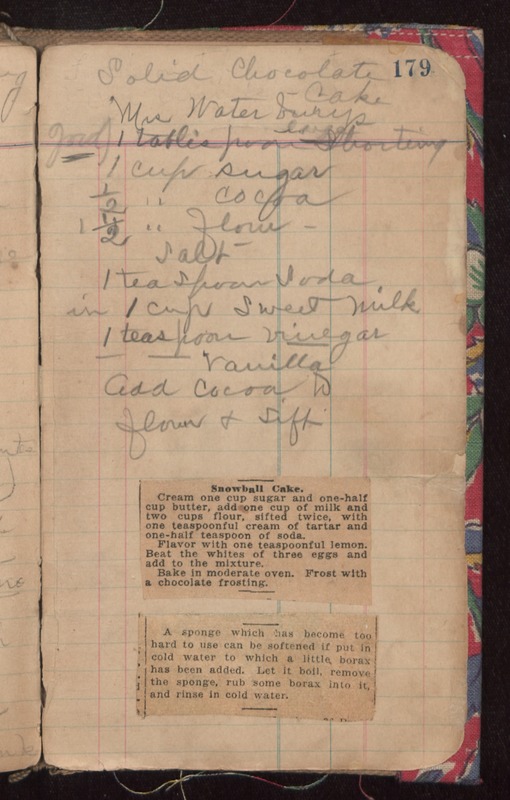 Cream one cup sugar and one-half cup butter, add one cup of milk and two cups flour, sifted twice, with one teaspoonful cream of tartar and one-half teaspoon of soda. Flavor with one teaspoonful lemon. Beat the whites of three eggs and add to the mixture. Bake In moderate oven. Frost with a chocolate frosting. A sponge which has become too hard to use can be softened if put in cold water to which a little borax has been added. Let it boil, remove the sponge, rub some borax into it, and rinse in cold water.